Our team was producing prototypes at varying level of fidelity for the same rounds of research. 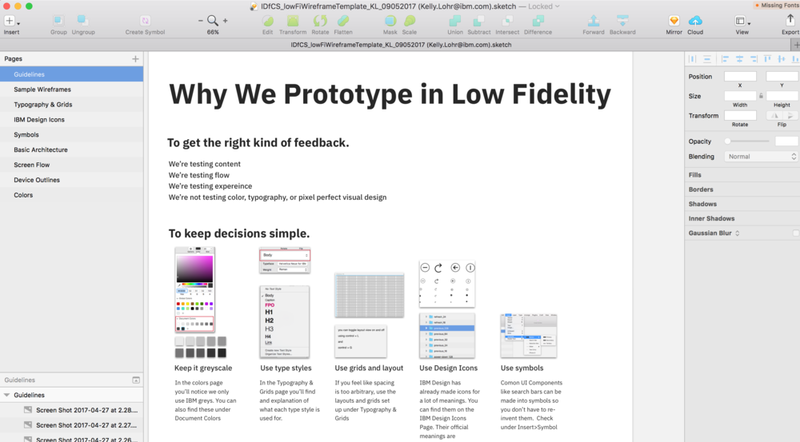 Prototypes consequently received varying levels of feedback, some on content, others on visual styling. I created a template for a team of many designers to create visually unified prototypes so users could more easily identify what kind of feedback to provide in testing. The IBM Design for Client Services UX team has a way to rapidly prototype visually unified, low-fidelity prototypes. These appear in the early stages of every UX project our team touches. When asking designers to adopt a new practice, I though it would be helpful to provide explanation of why this change was important. I keep an updated set of sample screens to provide inspiration on how to use the components of the template while creating different products. Common interaction elements are easily accessible so designers don't have to start from scratch every time. Sharp Sticks are a kind of prototype used in the early, generative phase of a design project. The idea is to create intentionally triggering prototypes in order to provoke strong reactions from users. I shared the concept with our team to encourage more prototyping early in the design process. Our team now plans "sharp sticks" testing into all project plans, and we recieve pointed UX feedback much earlier in our research process.